Check out Shlock Rock’s Educator’s Newsletter available to all teachers (and parents) out there, and it’s FREE! Each monthly edition is geared towards Early Elementary School and Preschool teachers and parents with the goal of sharing ideas to help teach about the Holidays, Torah, Mitzvot and Middot, and Israel the Shlock Rock way! To join our group, please email our Director of Education, Nechama Retting at education@shlockrock.com. Educators all over the world use Shlock Rock songs to instill Jewish children and teenagers with a love of Judaism and Jewish learning. Use the songs to trigger discussions about holidays, Jewish values, Shabbat, prayer and a range of other topics. Enhance your lesson plans using Shlock Rock lyrics. 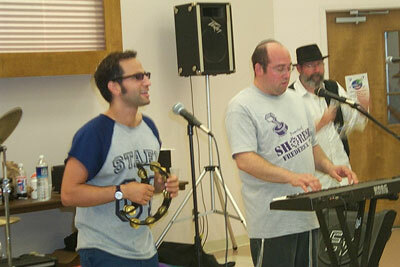 Shlock Rock songs and parodies are ideal for reaching Jewish youngsters on their own terms – with music. We are currently searching for exciting lesson plans which use Shlock Rock songs to teach about being Jewish. Send your lesson plans to lessons@shlockrock.comand if we use your lesson plan on our website you will receive a complimentary Shlock Rock CD/tape of your choice. Peruse the lesson plans that are already on the site to see what we are looking for. We’ll gladly make space in this section to share good ideas and give you credit for them. Submit lesson plans by e-mail only to lessons@shlockrock.com. A complete lesson plan must be submitted including goals, materials, level and method. We reserve the right to edit and change all submissions. Any lesson plan submitted may appear on the website without further permission from the author. Bookmark this page so you can take a look at the lesson plans and other ideas we’ll be adding before Jewish holidays and throughout the year.